If the feed tray of the press is in position, the work piece carpet is pressed under the holding device. With the vacuum it is held in position and rotated by 180˚. Then the vacuum turns off and the work pieces carpet is turned and the part will be processed directly on the turn over device. Once the shuttle tray has reached the position in the out-feed of the press the turn-over flipper system flips the whole carpet of work pieces by 180˚. 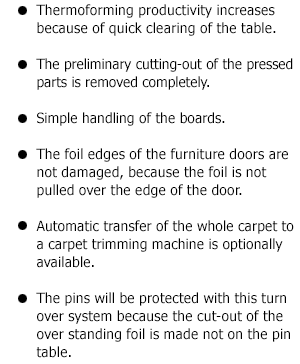 During the turn-over cycle, a vacuum system is activated to firmly hold the carpet of laid-up doors or components under the turn-over head. As soon as the 'Flipper head' has reached the final parking position, the vacuum will be switched off and the work piece carpet with doors (components) is ready for trimming. These systems deliver the selected roll of material to the working position at the touch of a button resulting in considerable improvements to output, particularly when working with smaller batch sizes of multiple foils. Extensively used adjacent to the press, the various models available can store between 8 and 19 rolls of foil vertically, saving a great deal of space. For larger volume manufacturers they also provide a useful method of storing bulk stock. Rolls are loaded onto the paternoster at low level reducing the risk of injury from lifting rolls of material to working height. It is important to establish the available height when considering how many rolls you wish to store and to also ensure the floor is of a suitable construction as the weight loading are considerable with larger units. The paternoster-foils storage system serve for the storage of the foil-rolls. 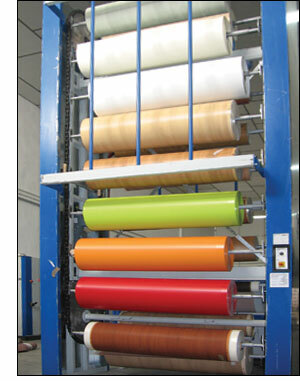 Next to the membrane press on a minimum of space a large quantity of foils-rolls can be stored. By pressing a button you can retrieve promptly and simply the needed foil-roll for the current pressing process. Options: Manual or automatic Cutting-System Foil Ionization.